MINISTER for Housing Damien English and representatives from the Department of Environment travelled to Inishowen yesterday to meet the group seeking redress for people with "crumbling" homes. Mica Action Group (MAG) chairman Phil McDaid said the group was delighted that Mr English also pledged to return again to Donegal within weeks to see the plight of affected homeowners in the Letterkenny and surrounding area. “During the meeting, we conveyed to him the many difficulties facing homeowners such as lack of insurability of their homes. We asked for his help in putting pressure on the insurance industry in providing cover for those affected," said Mr McDaid. 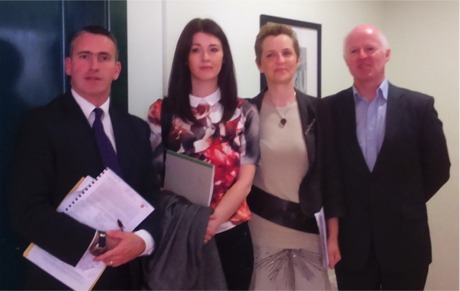 From left, Minister for Housing Damien English; Mica Action Group joint secretaries, Eileen Doherty and Ann Owens and chairman Phil McDaid pictured at a meeting in Carndonagh on June 20, 2016. "We also told him about the issue of loss of value of homes and the effect this is having on the housing market in the county as well as the many concerns over health and safety facing families. The fallout from this crisis in terms of the adverse effects this is having on many homeowners' health and wellbeing arising from the emotional distress was also communicated." The Minister and his departmental officials met three families in the Carndonagh area and saw first-hand the "devastating impact" the problem is having on homeowners, said Mr McDaid. If you think you are affected by this issue you can register your details at www.surveymonkey.com or contact MAG via Facebook.